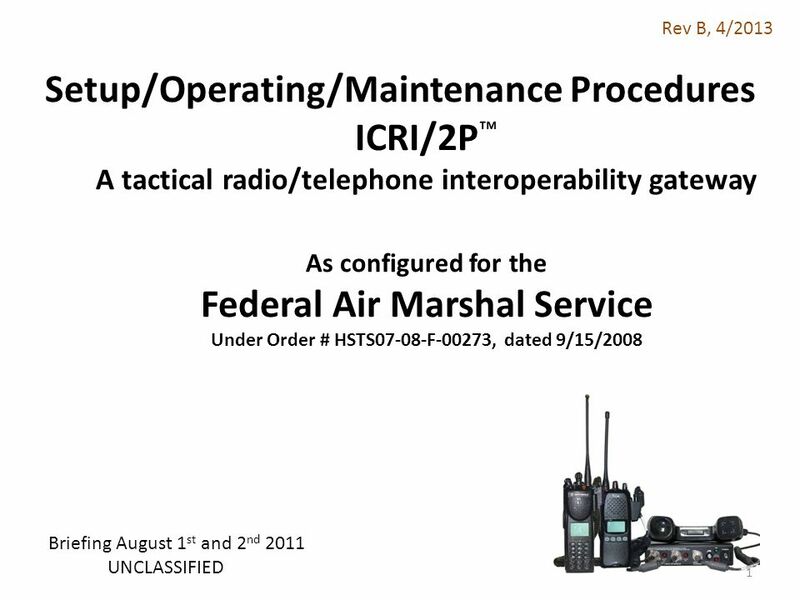 ICRI-2P TACTICAL RADIO/TELEPHONE INTEROPERABILITY GATEWAY Train-the-Trainer. This is a “Train-the-Trainer” course. As such, students will be provided all the materials required to provide instruction to others. The instructors will identify key points that should be emphasized when providing training on this equipment. a. 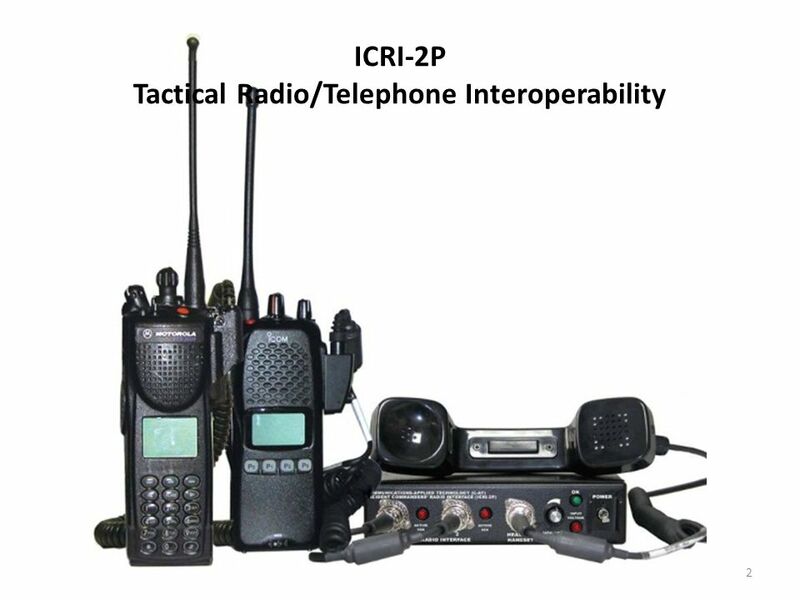 The ICRI provides a simple to operate radio interoperability kit that provides the user the ability to quickly interface multiple types of radios for cross-band/cross-platform operation. b. 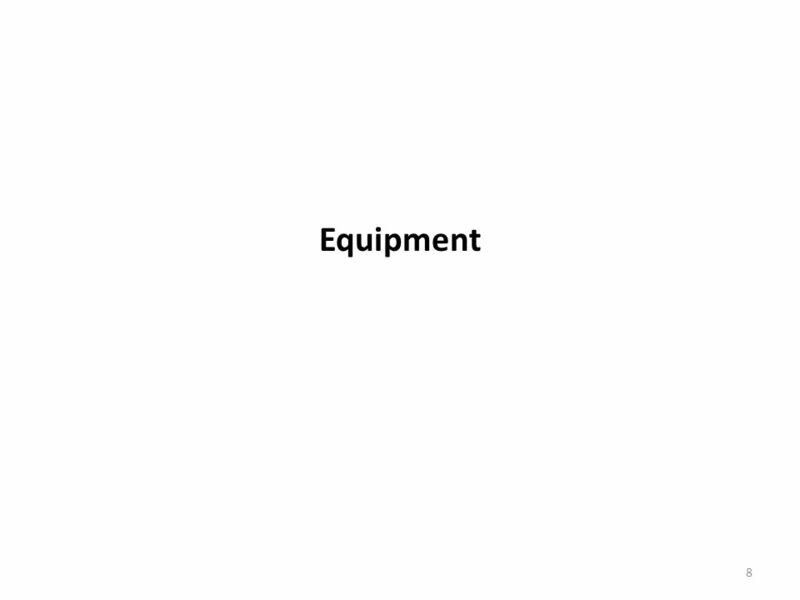 This kit is used for both actual operations and training purposes. NOTE: The instructors should introduce themselves and provide a brief explanation of their backgrounds to the students. 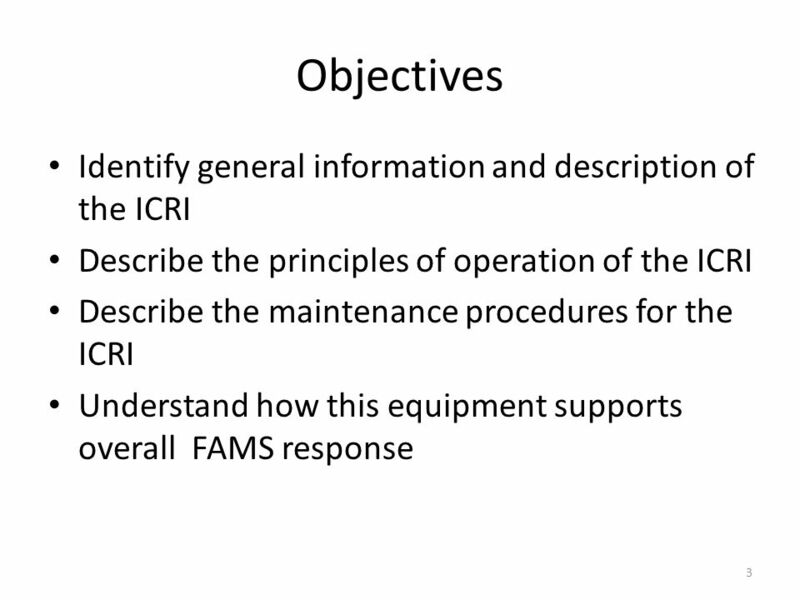 Describe the principles of operation of the ICRI Describe the maintenance procedures for the ICRI Understand how this equipment supports overall FAMS response OBJECTIVES At the conclusion of this course, students will be able to: a. Identify general information and description of the ICRI. This module will assist in identifying the kit’s general information and description, to include features and major components. b. Describe the principles of operation of the ICRI. This section will show how to operate the ICRI. c.	Describe the maintenance procedures for the ICRI. This section will address inspection points for the kit. d.	Understand how this equipment supports the overall IPP concept for CBRN response on the installation. The next three slides will provide a broad overview operational capabilities of the ICRI. Setup and operation will be discussed in greater detail in the following slides. 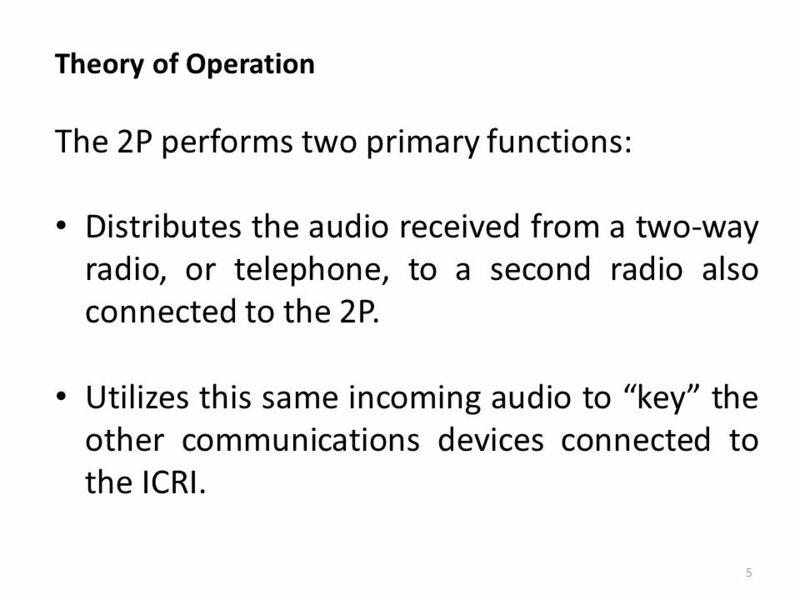 Theory of Operation The 2P performs two primary functions: Distributes the audio received from a two-way radio, or telephone, to a second radio also connected to the 2P. Utilizes this same incoming audio to “key” the other communications devices connected to the ICRI. Description A small, lightweight interconnect assembly for “bridging” dissimilar radios. Dissimilar radios can include varying models/frequencies, clear/encrypted radios, talk-around/trunked radios as well as land-line/cellular/satellite telephones. The ICRI performs two primary functions: Receive incoming audio. Incoming audio from one radio or telephone “keys” the other radios connected to the ICRI. Distribute audio. 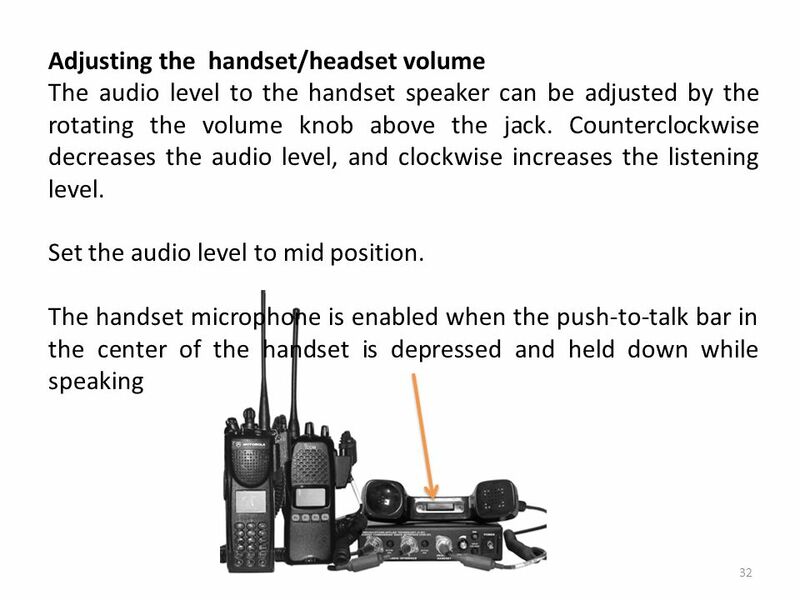 The incoming audio is then distributed to the other connected radios operating on different frequencies, telephone or recording device connected to the ICRI and broadcast over those additional frequencies. Quick Setup. Provides for quick set-up and extended operation without additional power or equipment in harsh operating environments. VOX Keying. Each audio input port, except the telephone port, uses a voice activation “radio key” and receive priority circuitry. 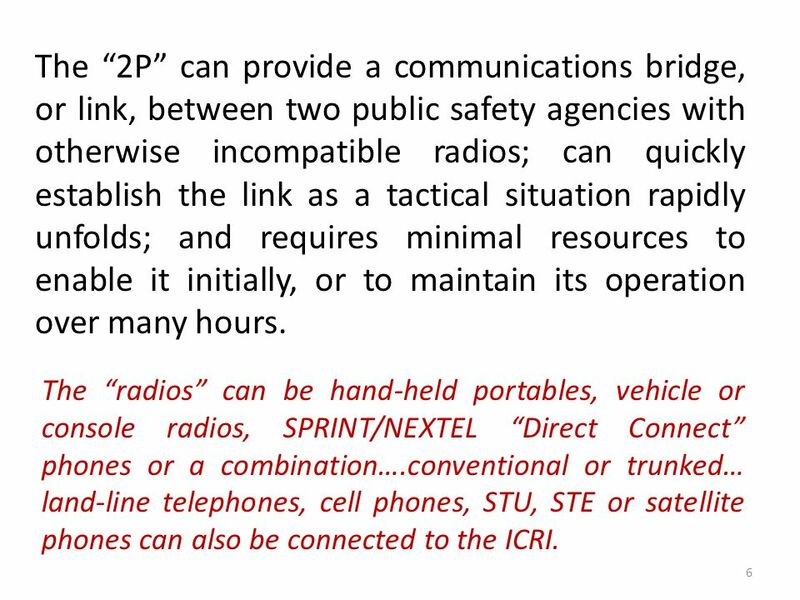 6 The “2P” can provide a communications bridge, or link, between two public safety agencies with otherwise incompatible radios; can quickly establish the link as a tactical situation rapidly unfolds; and requires minimal resources to enable it initially, or to maintain its operation over many hours. 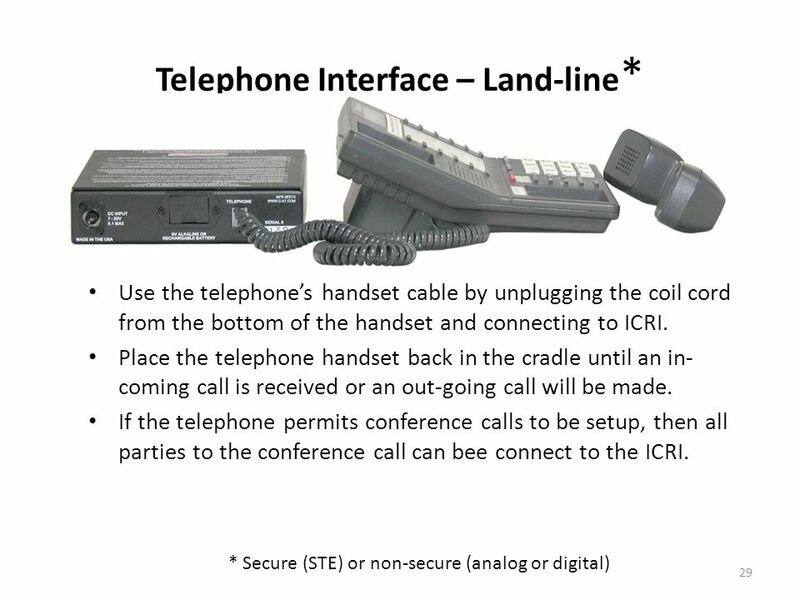 The “radios” can be hand-held portables, vehicle or console radios, SPRINT/NEXTEL “Direct Connect” phones or a combination….conventional or trunked… land-line telephones, cell phones, STU, STE or satellite phones can also be connected to the ICRI. 7 The 2P will remain fully operational for 30+ hours powered by an external “AA” battery pack (8 “AA alkaline batteries), 10+ hours powered by the internal, rechargeable battery, and indefinitely when powered by an AC source. 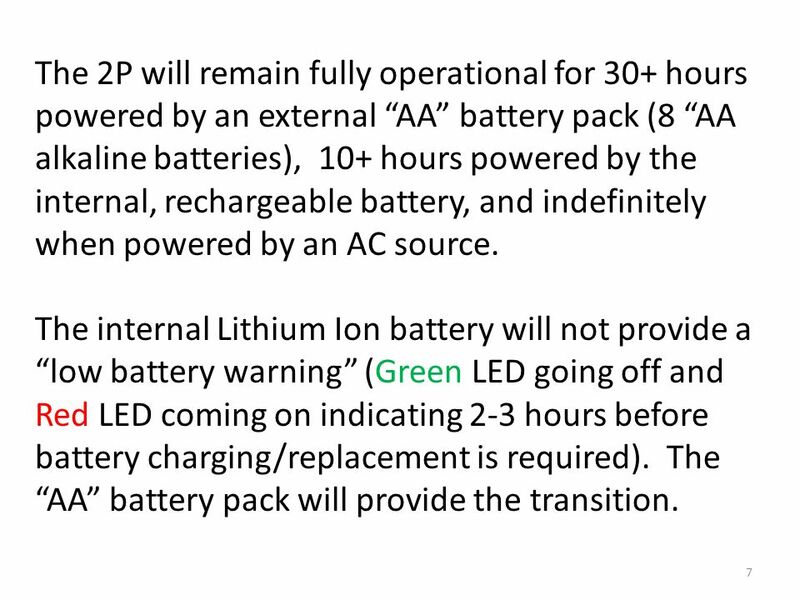 The internal Lithium Ion battery will not provide a “low battery warning” (Green LED going off and Red LED coming on indicating 2-3 hours before battery charging/replacement is required). The “AA” battery pack will provide the transition. Some pre-planning is necessary to ready the ICRI for rapid deployment. The following should be accounted for before placing the ICRI on-line: Determine what the power source will be for the ICRI. Verify that the internal battery is charged or that one of the external power source option are available. 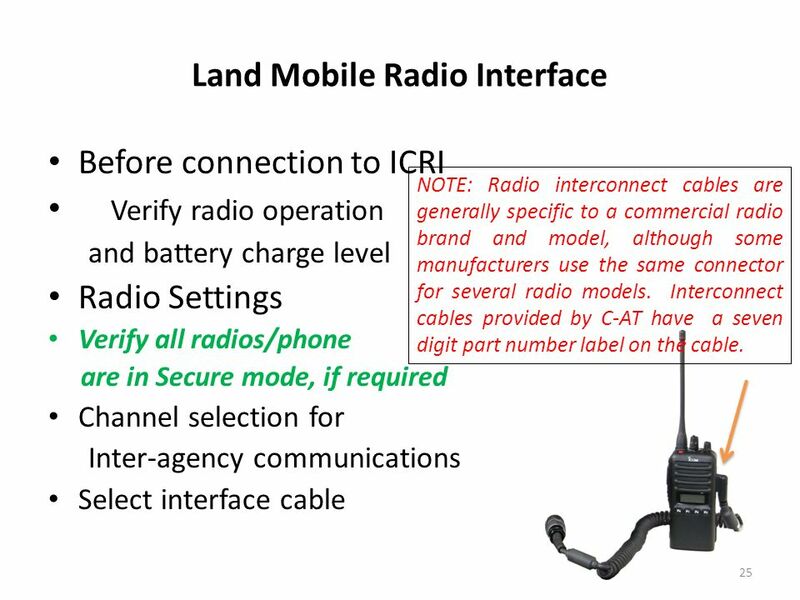 Determine what brand and model of radios will be connected to the ICRI and that an “interface” cable for each radio is available. 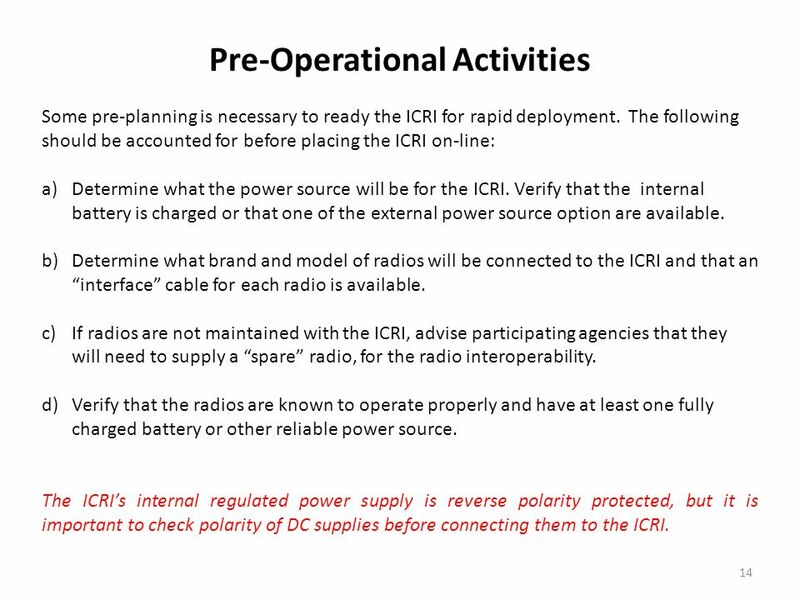 If radios are not maintained with the ICRI, advise participating agencies that they will need to supply a “spare” radio, for the radio interoperability. Verify that the radios are known to operate properly and have at least one fully charged battery or other reliable power source. 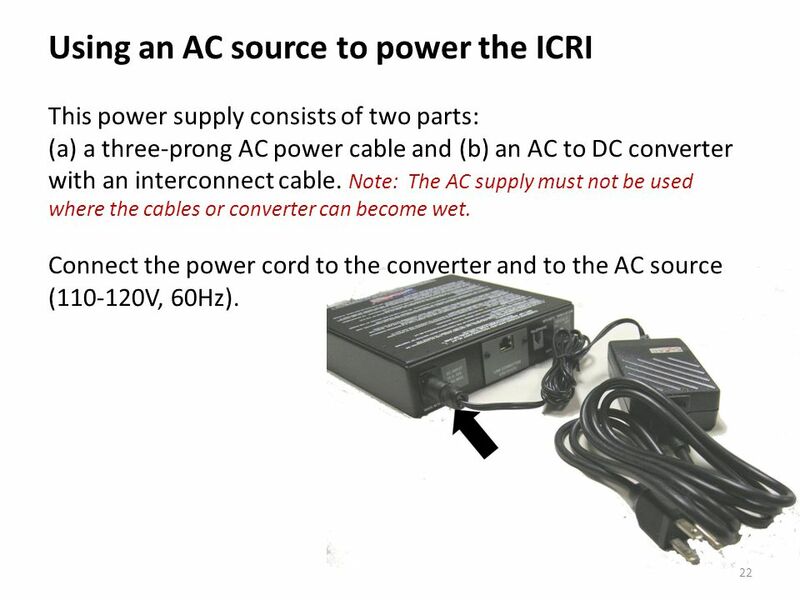 The ICRI’s internal regulated power supply is reverse polarity protected, but it is important to check polarity of DC supplies before connecting them to the ICRI. Preoperational Activities Before setting up the ICRI for operation, determine how the ICRI will be setup. Power. Predetermine what the power source will be for the ICRI and verify that the cable or battery pack is available. Radio interconnect cables. 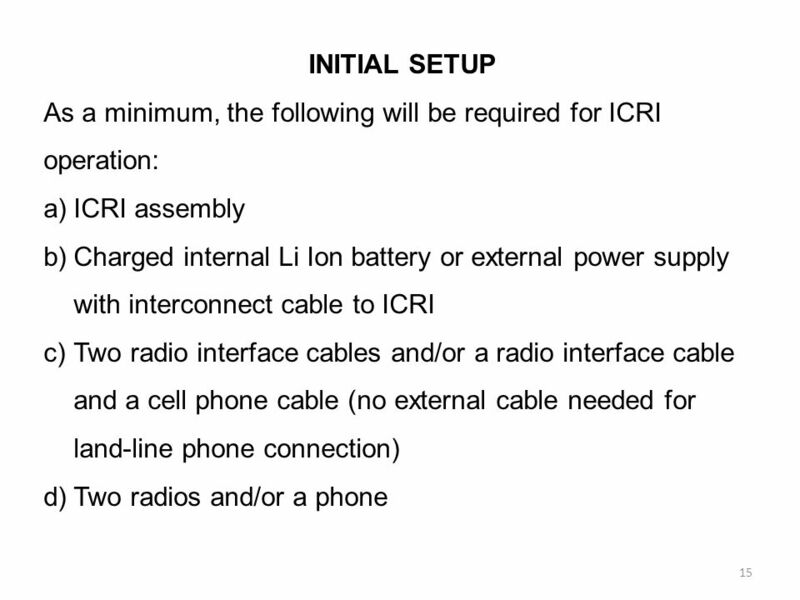 Predetermine what brand and model of radios will be connected to the ICRI and that an “interconnect” cable for each radio is available. Agency radios. Advice agencies that they will need to supply a “spare” radio, for the radio interoperability, that the radio supplied must be known to operate properly and have at least one fully charged battery. 17 NO TOOLS ARE NEEDED TO REMOVE THE TRAY AND REPLACE THE BATTERIES. 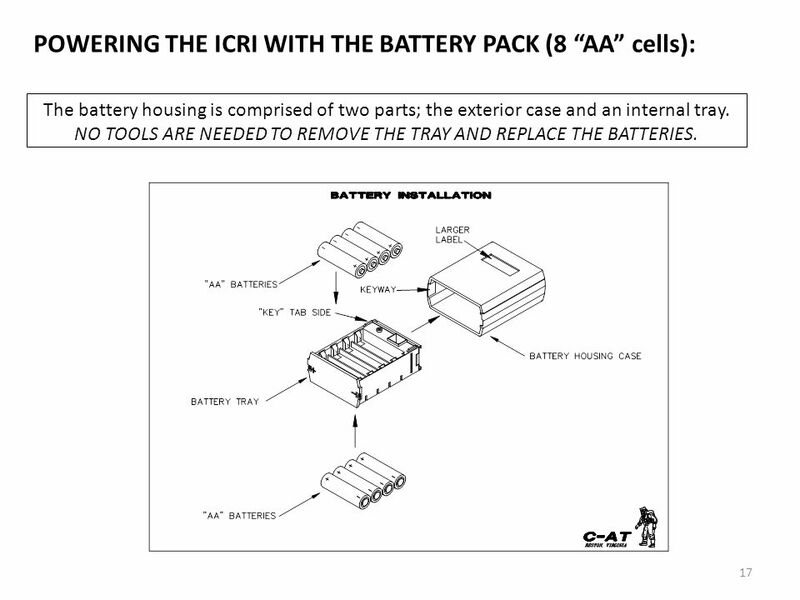 POWERING THE ICRI WITH THE BATTERY PACK (8 “AA” cells): The battery housing is comprised of two parts; the exterior case and an internal tray. NO TOOLS ARE NEEDED TO REMOVE THE TRAY AND REPLACE THE BATTERIES. Hold the battery housing securely in the palm of the hand with metal battery terminal plate facing up. Push firmly on the center of the battery terminal plate, until the battery tray is released. 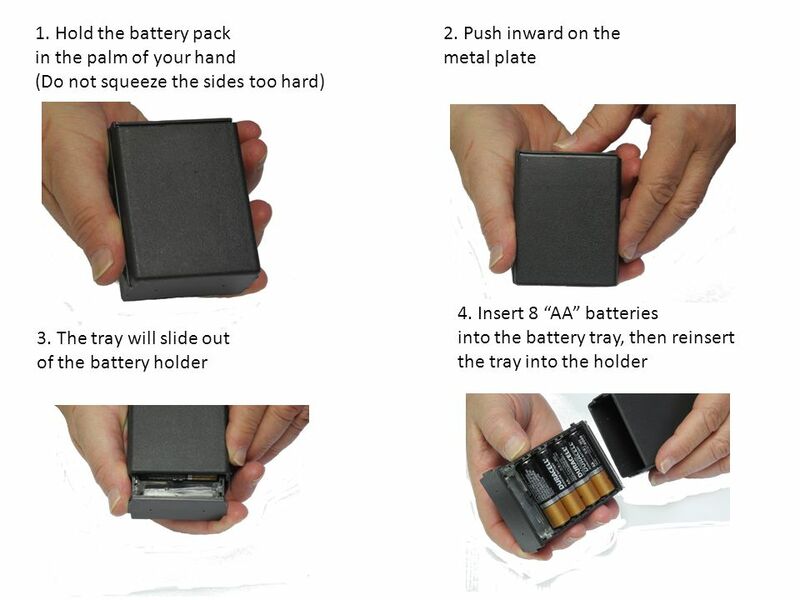 Remove old batteries and discard properly. 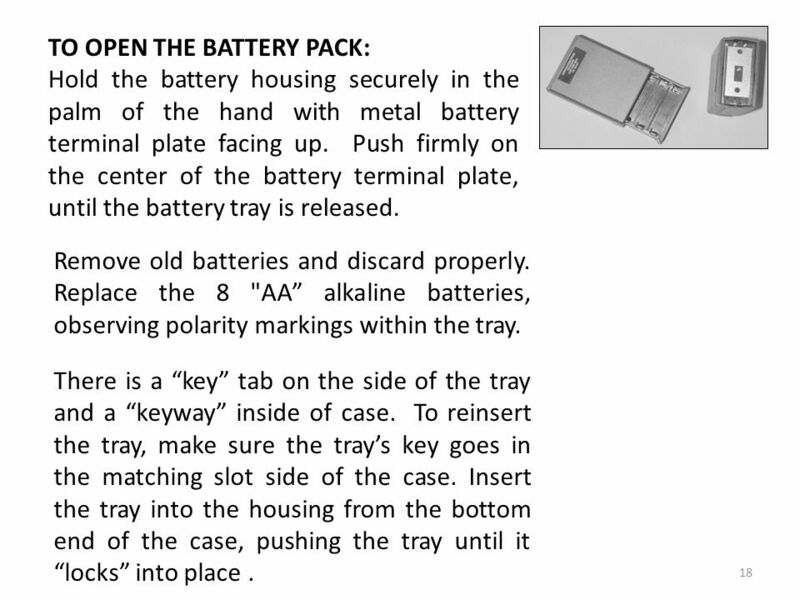 Replace the 8 "AA” alkaline batteries, observing polarity markings within the tray. There is a “key” tab on the side of the tray and a “keyway” inside of case. To reinsert the tray, make sure the tray’s key goes in the matching slot side of the case. Insert the tray into the housing from the bottom end of the case, pushing the tray until it “locks” into place . 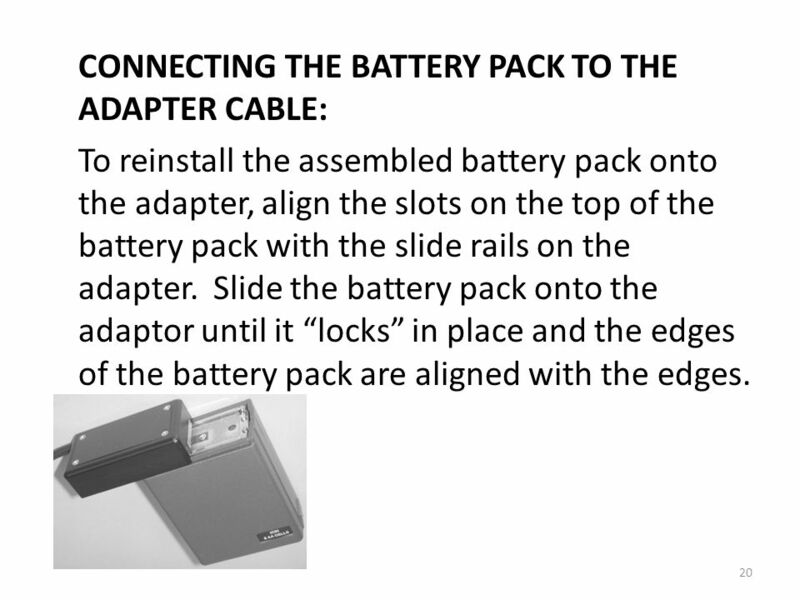 20 CONNECTING THE BATTERY PACK TO THE ADAPTER CABLE: To reinstall the assembled battery pack onto the adapter, align the slots on the top of the battery pack with the slide rails on the adapter. 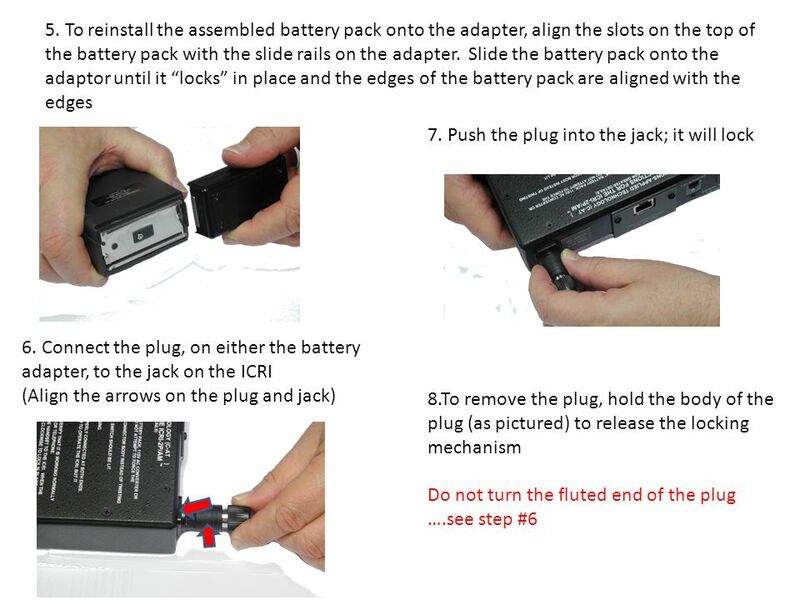 Slide the battery pack onto the adaptor until it “locks” in place and the edges of the battery pack are aligned with the edges. of the adaptor. 22 Using an AC source to power the ICRI This power supply consists of two parts: (a) a three-prong AC power cable and (b) an AC to DC converter with an interconnect cable. Note: The AC supply must not be used where the cables or converter can become wet. Connect the power cord to the converter and to the AC source ( V, 60Hz). 23 Connect the other end of the assembled cable to the ICRI’s rear panel jack labeled DC INPUT. 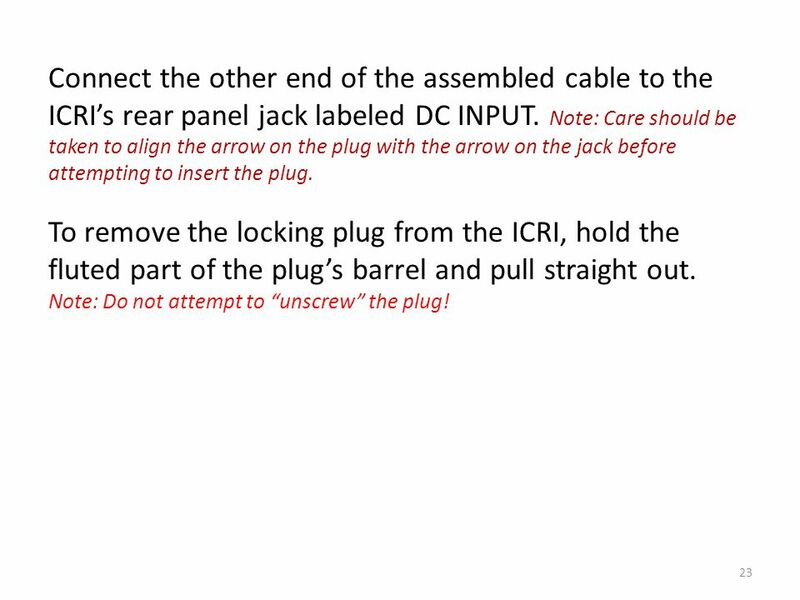 Note: Care should be taken to align the arrow on the plug with the arrow on the jack before attempting to insert the plug. To remove the locking plug from the ICRI, hold the fluted part of the plug’s barrel and pull straight out. Note: Do not attempt to “unscrew” the plug! This three position switch is used to turn the ICRI “ON” and “OFF” whether the ICRI is to be powered by the internal, rechargeable battery, or an external power supply. To use the internal power source, place the handle of the switch in the UP position (labeled “internal battery”). To use an external power source place the handle of the switch in the DOWN position (labeled “EXTERNAL BAT/CHG”). 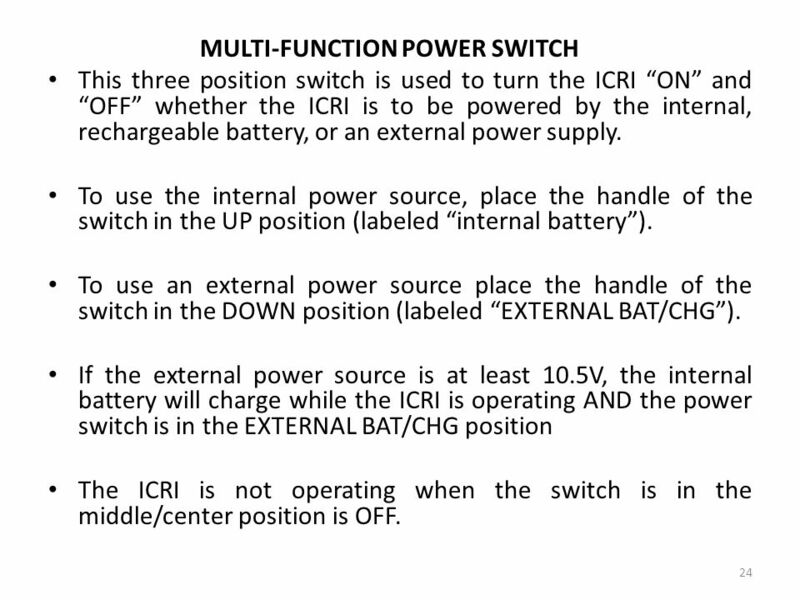 If the external power source is at least 10.5V, the internal battery will charge while the ICRI is operating AND the power switch is in the EXTERNAL BAT/CHG position The ICRI is not operating when the switch is in the middle/center position is OFF. Before connection to ICRI Verify radio operation and battery charge level Radio Settings Verify all radios/phone are in Secure mode, if required Channel selection for Inter-agency communications Select interface cable NOTE: Radio interconnect cables are generally specific to a commercial radio brand and model, although some manufacturers use the same connector for several radio models. Interconnect cables provided by C-AT have a seven digit part number label on the cable. 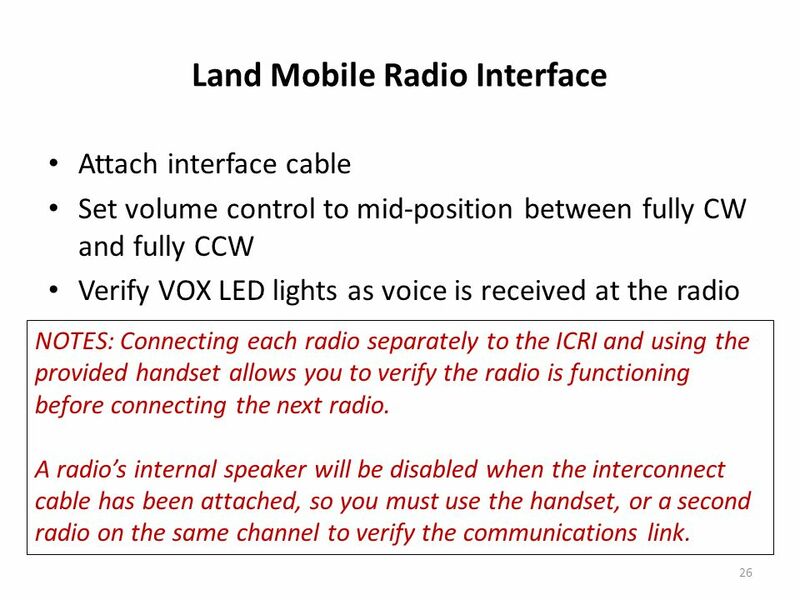 Land Mobile Radio Interface – Pt. 1 Radio interconnect cables are generally specific to a commercial radio brand and model, although some manufacturers use the same connector for several radio models. Interconnect cables provided by C-AT have the same setup procedure have a seven digit part number label on the cable. 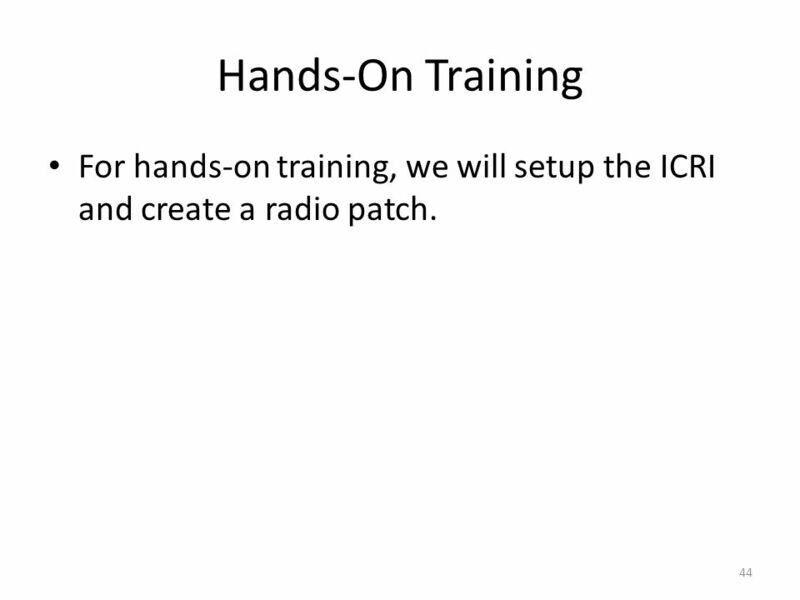 There no modifications to be made to the radios or the ICRI during setup. Verify Radio. Operation. Verify the radio to be connected is full operational and the speaker/mic/accessory jack is operational Batteries. The radio has fully charged batteries TX/RX. The radio can transmit and receive Radio Settings. Channel. Set the radio to the desired channel Volume. Set the radio volume to mid position Connect Interface cable. 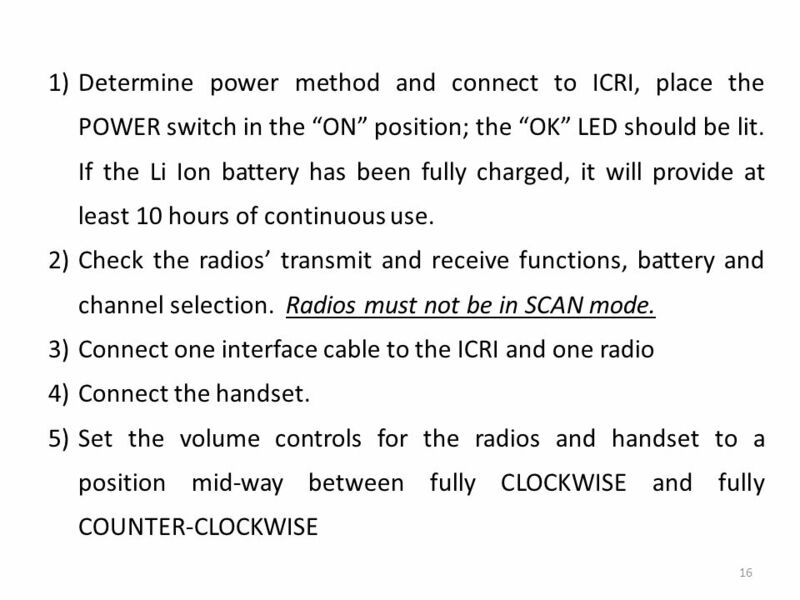 Install the radio-end of the ICRI interconnect cable onto the radio, as you would install other radio accessories (i.e. : a shoulder speaker / microphone). Tightening any locking screws is optional; but it is important that the connector be firmly seated against the radio so that good electrical contact is made. Attach the other end of the cable to any of the LAND MOBILE RADIO INTERFACE jacks. 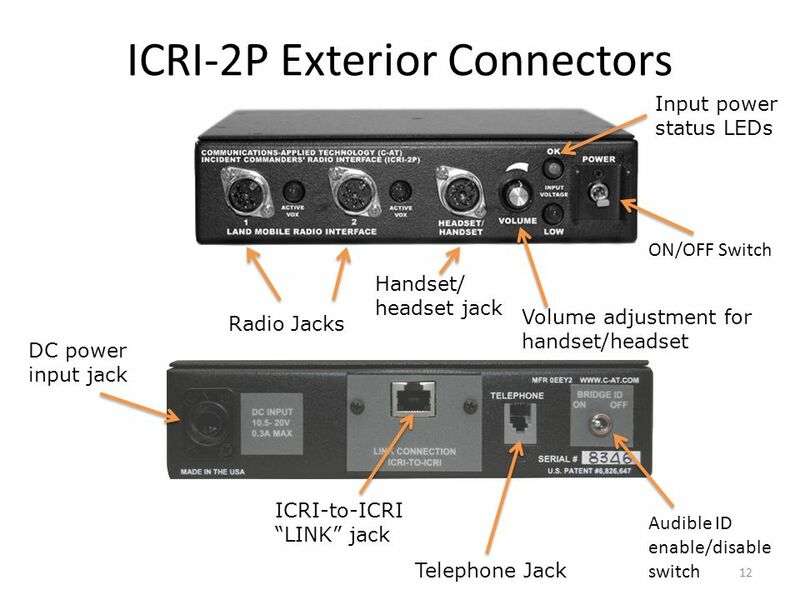 Attach interface cable Set volume control to mid-position between fully CW and fully CCW Verify VOX LED lights as voice is received at the radio NOTES: Connecting each radio separately to the ICRI and using the provided handset allows you to verify the radio is functioning before connecting the next radio. 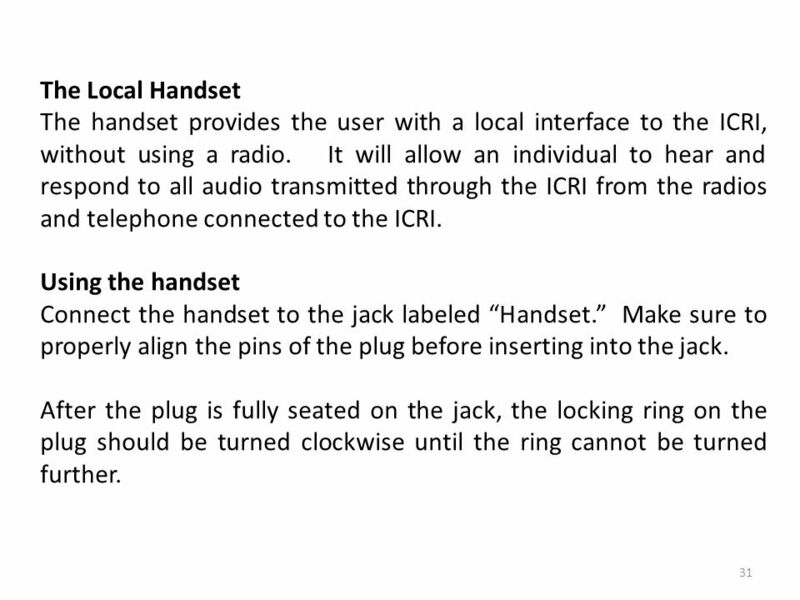 A radio’s internal speaker will be disabled when the interconnect cable has been attached, so you must use the handset, or a second radio on the same channel to verify the communications link. Land Mobile Radio Interface – Pt. 2 Attach interface cable. Attach the interface cable to any of the LAND MOBILE RADIO INTERFACE jacks and a radio on the other end. Select Talk Group. Talk group switches are inline with the corresponding jack. Set the talk group switch for each connected radio Up: Talk Group One Down: Talk Group Two Center: no Talk Group connection (mute) Verify LED lights. The LEDs directly above the radio ports in use should flicker as the radio is transmitting. If they remain solidly lit, turn down the volume. If they are not lit, turn the volume up. 27 To disconnect the connector for cable storage, push inward on the locking ring with minimal force, and at the same time turn the ring counter-clockwise 1/8 (45o) turn to release the locking mechanism. 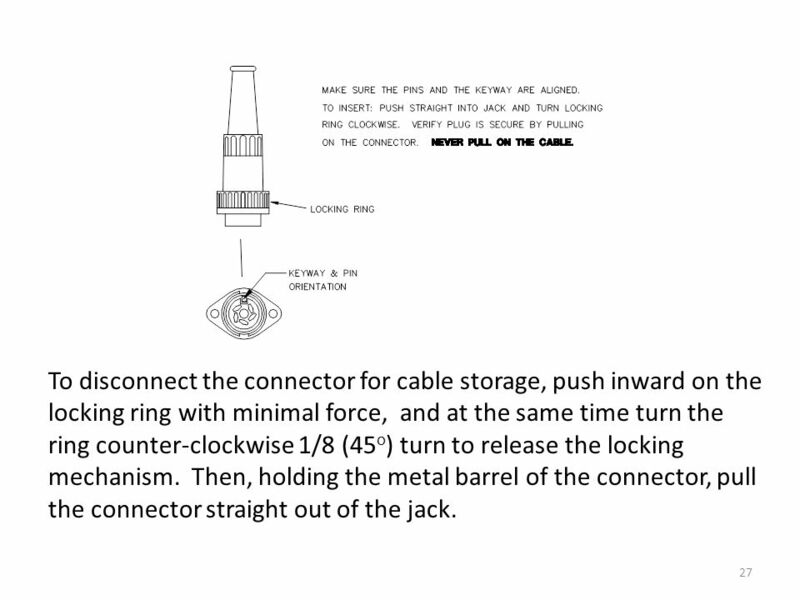 Then, holding the metal barrel of the connector, pull the connector straight out of the jack. 28 TELEPHONE INTERFACE This jack supports the connection of the ICRI to a land-line telephone through the telephone’s handset wiring (using the coiled cord between the telephone’s base with touchpad and the handset) or the 3.5mm jack on a cell phone (using C-AT interconnect cable P/N ). 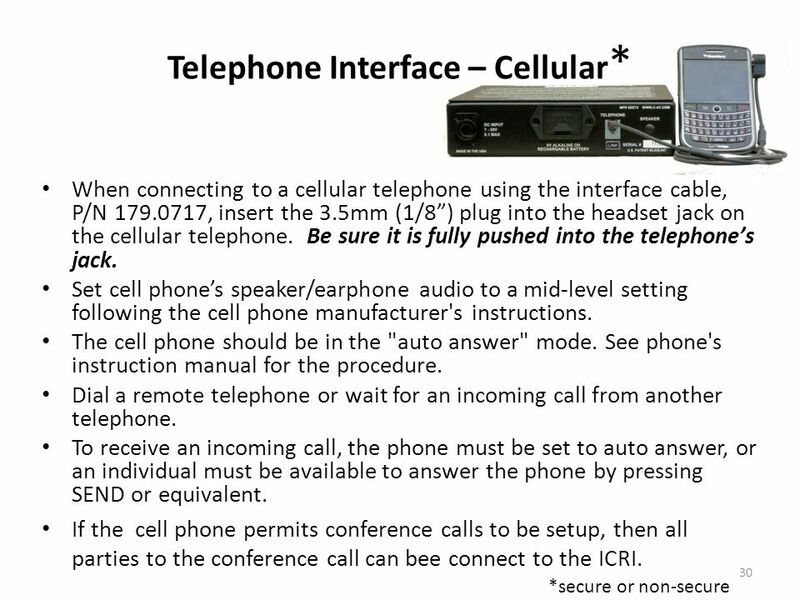 A phone connected to the ICRI will be used for dialing and other keypad functions since the speaker and microphone functions are disabled. 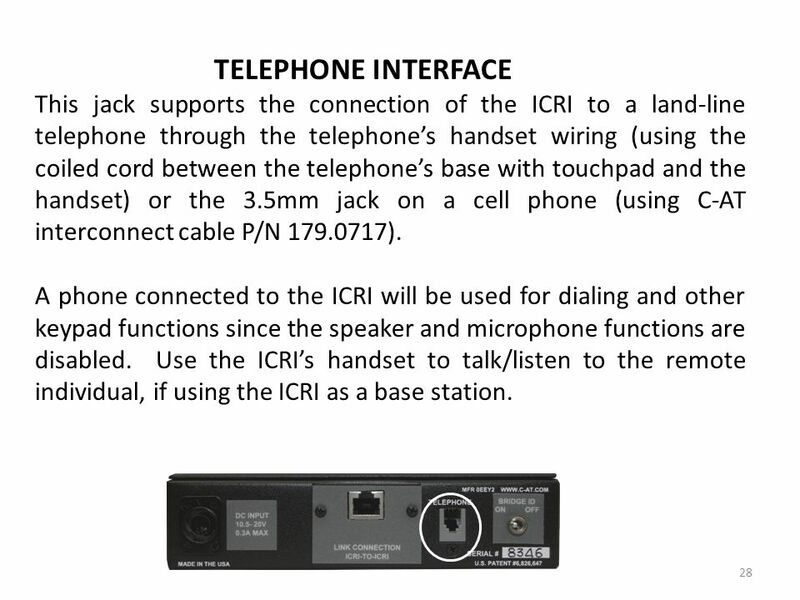 Use the ICRI’s handset to talk/listen to the remote individual, if using the ICRI as a base station. 31 The Local Handset The handset provides the user with a local interface to the ICRI, without using a radio. It will allow an individual to hear and respond to all audio transmitted through the ICRI from the radios and telephone connected to the ICRI. Using the handset Connect the handset to the jack labeled “Handset.” Make sure to properly align the pins of the plug before inserting into the jack. After the plug is fully seated on the jack, the locking ring on the plug should be turned clockwise until the ring cannot be turned further. 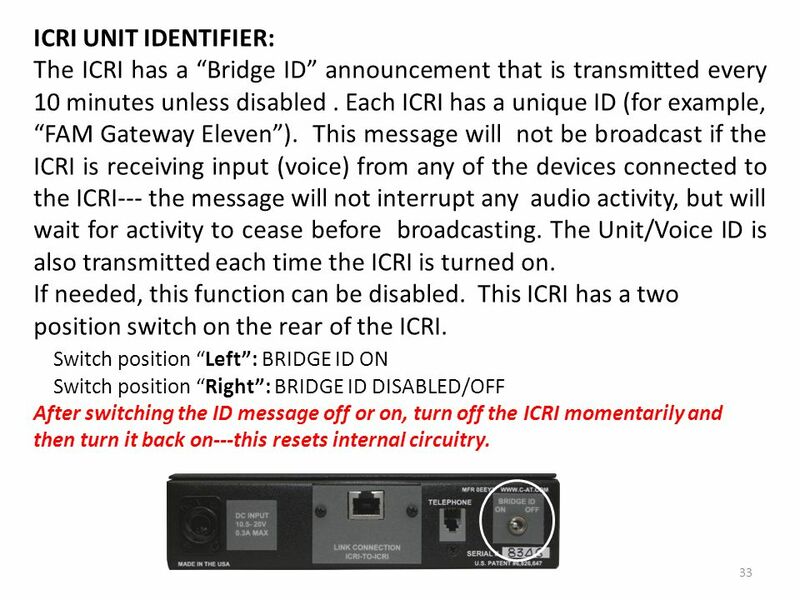 ICRI UNIT IDENTIFIER: The ICRI has a “Bridge ID” announcement that is transmitted every 10 minutes unless disabled . Each ICRI has a unique ID (for example, “FAM Gateway Eleven”). This message will not be broadcast if the ICRI is receiving input (voice) from any of the devices connected to the ICRI--- the message will not interrupt any audio activity, but will wait for activity to cease before broadcasting. The Unit/Voice ID is also transmitted each time the ICRI is turned on. If needed, this function can be disabled. This ICRI has a two position switch on the rear of the ICRI. Switch position “Left”: BRIDGE ID ON Switch position “Right”: BRIDGE ID DISABLED/OFF After switching the ID message off or on, turn off the ICRI momentarily and then turn it back on---this resets internal circuitry. 34 *A “standard” CAT5 cable will not work. 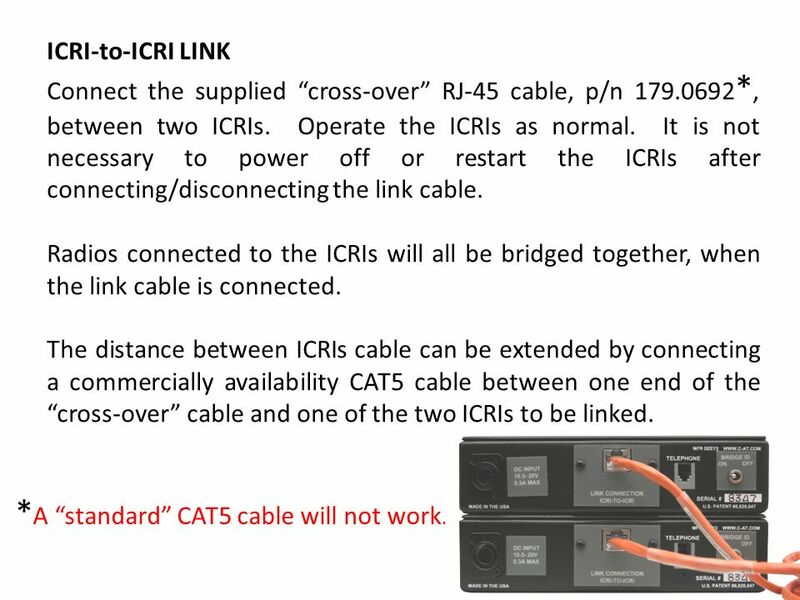 ICRI-to-ICRI LINK Connect the supplied “cross-over” RJ-45 cable, p/n *, between two ICRIs. Operate the ICRIs as normal. It is not necessary to power off or restart the ICRIs after connecting/disconnecting the link cable. 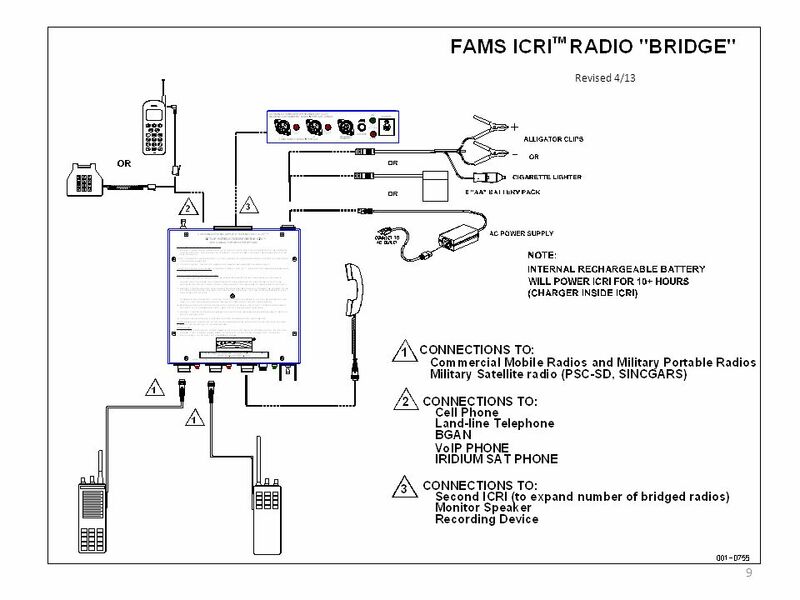 Radios connected to the ICRIs will all be bridged together, when the link cable is connected. The distance between ICRIs cable can be extended by connecting a commercially availability CAT5 cable between one end of the “cross-over” cable and one of the two ICRIs to be linked. 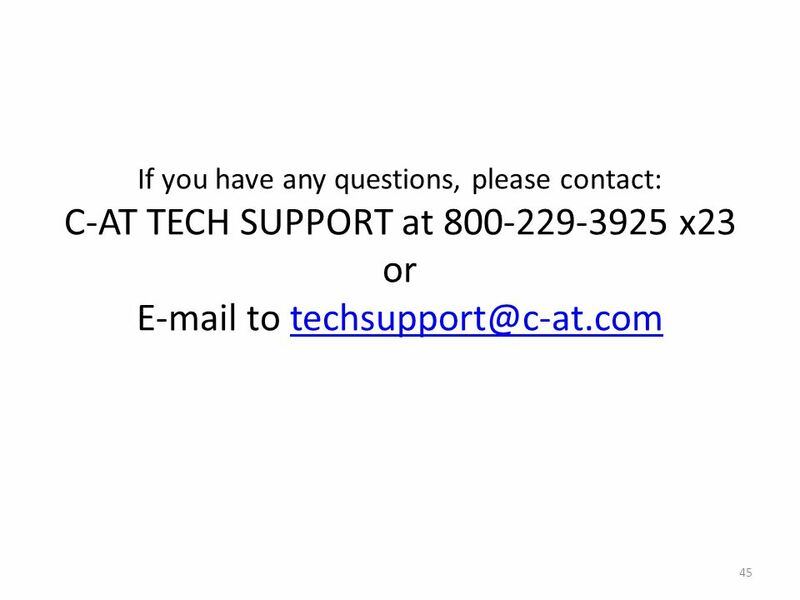 *A “standard” CAT5 cable will not work. 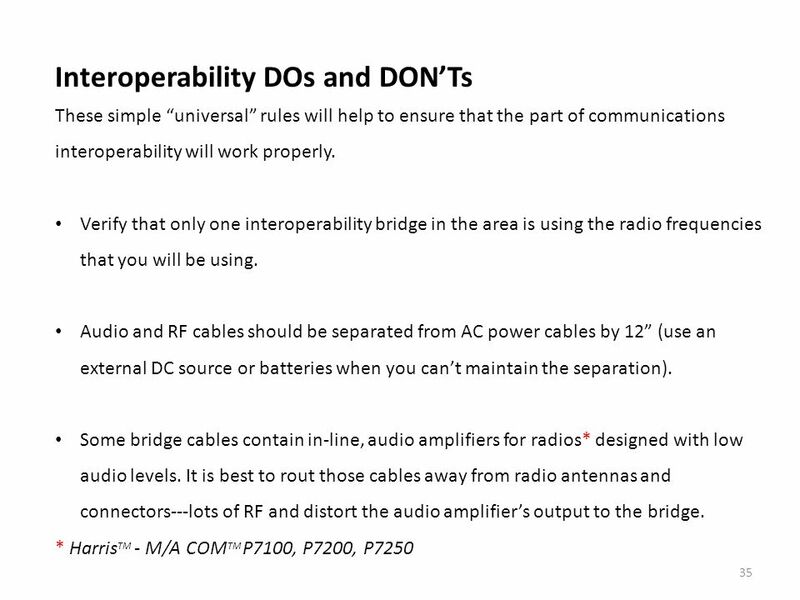 These simple “universal” rules will help to ensure that the part of communications interoperability will work properly. Verify that only one interoperability bridge in the area is using the radio frequencies that you will be using. Audio and RF cables should be separated from AC power cables by 12” (use an external DC source or batteries when you can’t maintain the separation). Some bridge cables contain in-line, audio amplifiers for radios* designed with low audio levels. It is best to rout those cables away from radio antennas and connectors---lots of RF and distort the audio amplifier’s output to the bridge. * HarrisTM - M/A COMTM P7100, P7200, P7250 INTEROPERABILITY DO’S AND DON’TS There are several important considerations when setting up an interoperability bridge that will improve the effectiveness of the bridge and your radios. Maintain COMSEC. When forming interoperability bridges verify that only encrypted radios are connected to other encrypted radios and at the same level of encryption. Verify only one bridge connected on frequencies. Verify that only one interoperability bridge in the area is using the radio frequencies that you will be using. Maintain RF Separation. Power sources. Audio and RF cables should be separated from AC power cables by 12” (use an external DC source or batteries when you can’t maintain the separation). Other radios. When plugging in two or more radios within the same radio band (i.e. 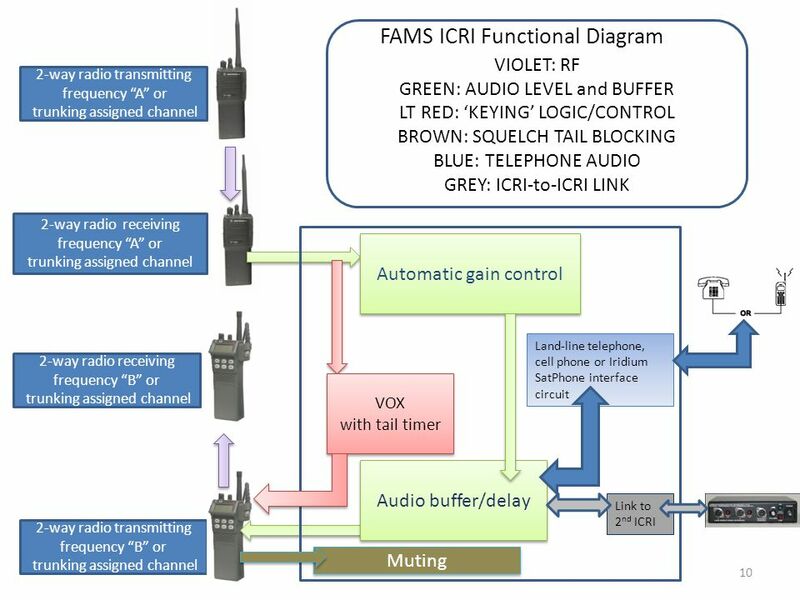 VHF) into a radio bridge, like the ICRI, provide as much vertical separation as possible to reduce the chance for interference due to the transmitted signal from one radio reducing the receive sensitivity of the other “in band” radios. Consider using external mobile antennas connected to the radios if necessary. Use only bridge interconnect cables that are well shielded. In-line audio amplifiers. Some bridge cables contain in-line, audio amplifiers for radios designed with low audio levels. It is best to rout those cables away from radio antennas and connectors---lots of RF and distort the audio amplifier’s output to the bridge. Don’t use “SCAN” mode on connected radios. This is particularly important when you are using the bridge as a tactical repeater, where two or more radios have similar channel programming. 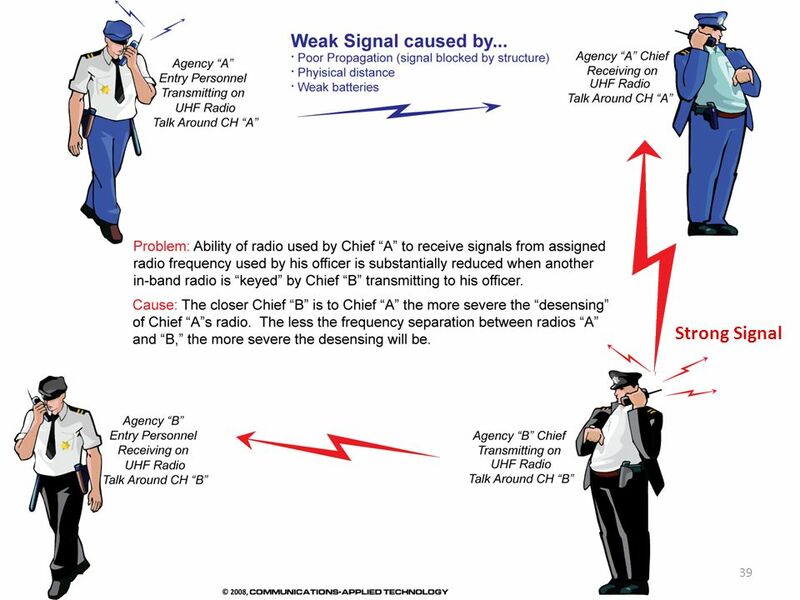 If both radios are capable of hearing the same signal, they will key each other up "ping-pong", interfering with the function of the bridge. When plugging in two or more radios within the same radio band (i.e. 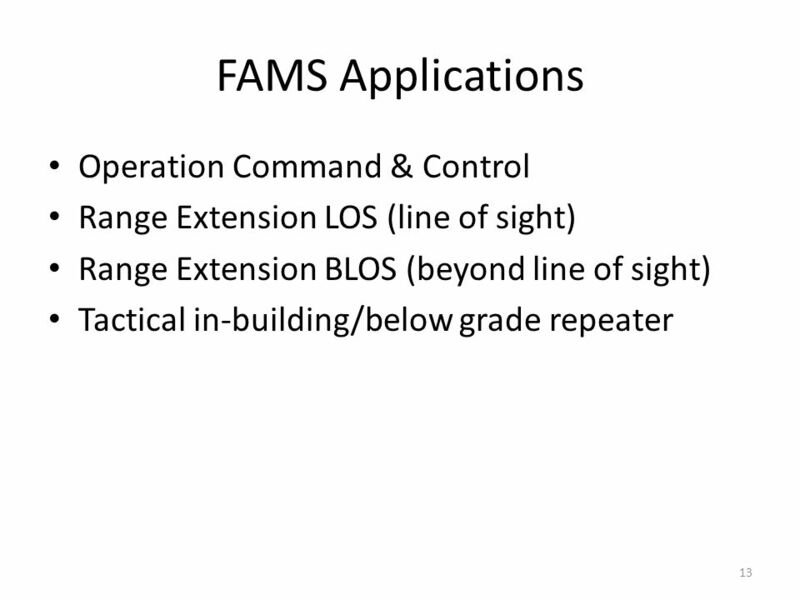 FAMS VHF radios) into a radio bridge, you must provide as much vertical separation as possible to reduce the chance for interference due to the transmitted signal from one radio reducing the receive sensitivity of the other “in band” radios. 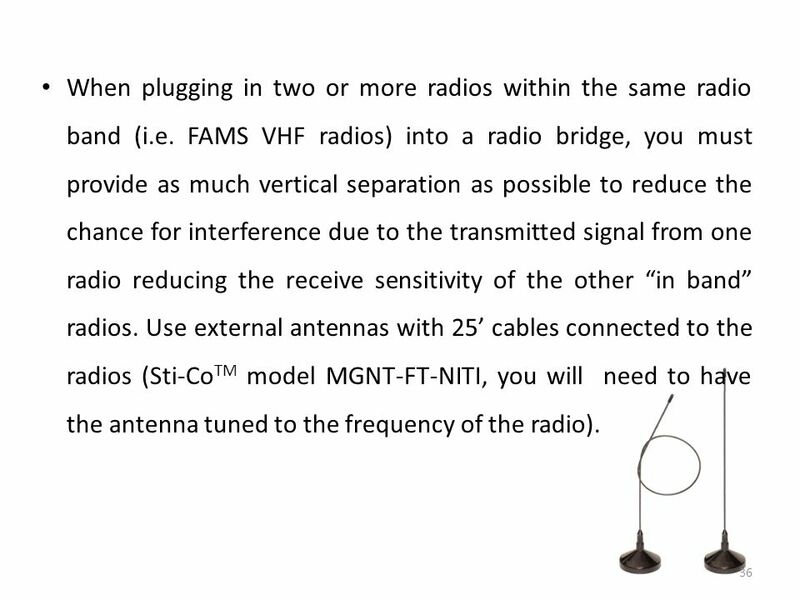 Use external antennas with 25’ cables connected to the radios (Sti-CoTM model MGNT-FT-NITI, you will need to have the antenna tuned to the frequency of the radio). Don’t use “SCAN” mode for any radios connected to a radio bridge. 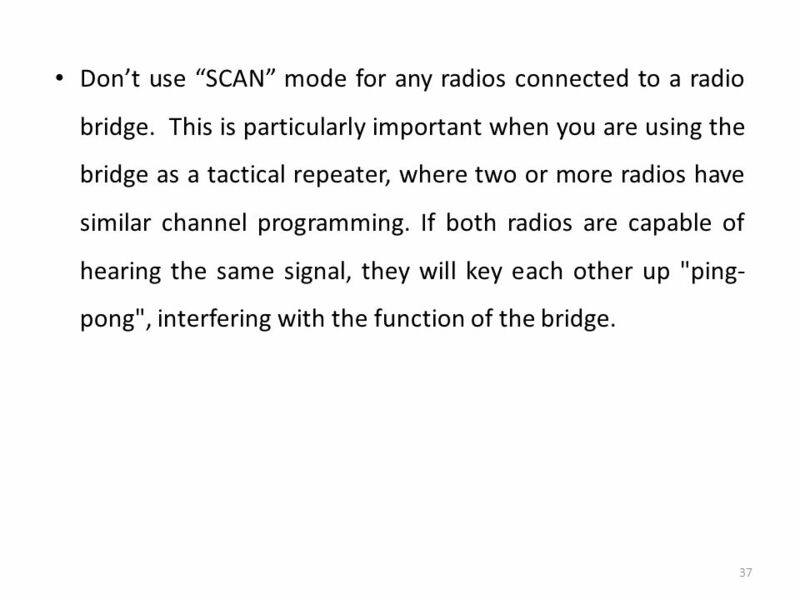 This is particularly important when you are using the bridge as a tactical repeater, where two or more radios have similar channel programming. 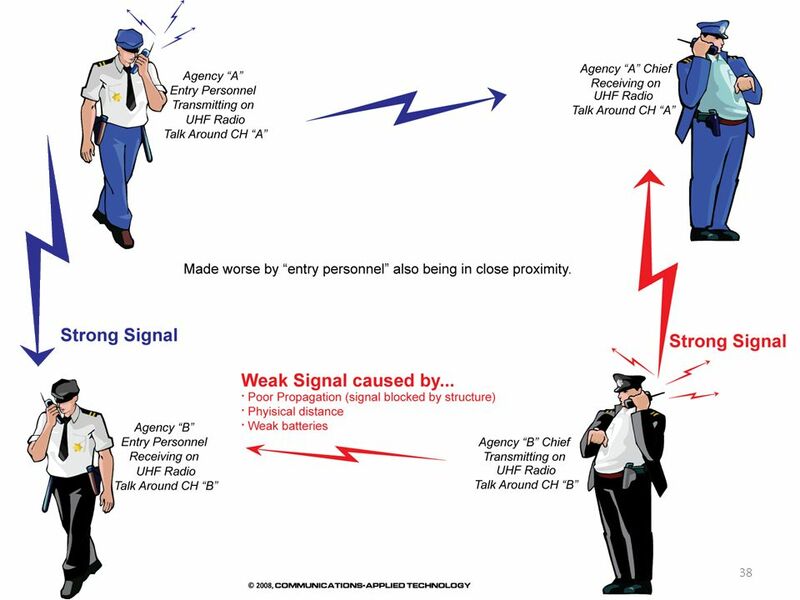 If both radios are capable of hearing the same signal, they will key each other up "ping-pong", interfering with the function of the bridge. 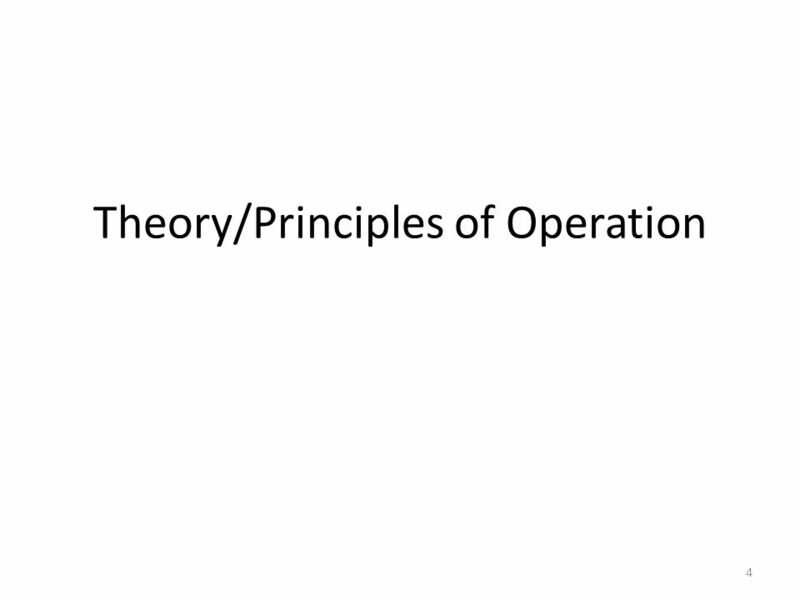 Transition from principles of operation to maintenance procedures. 41 Equipment Inspection Inspect jacks, switches and knobs visually and for function Inspect interconnect cables Inspect “AA” battery housing . 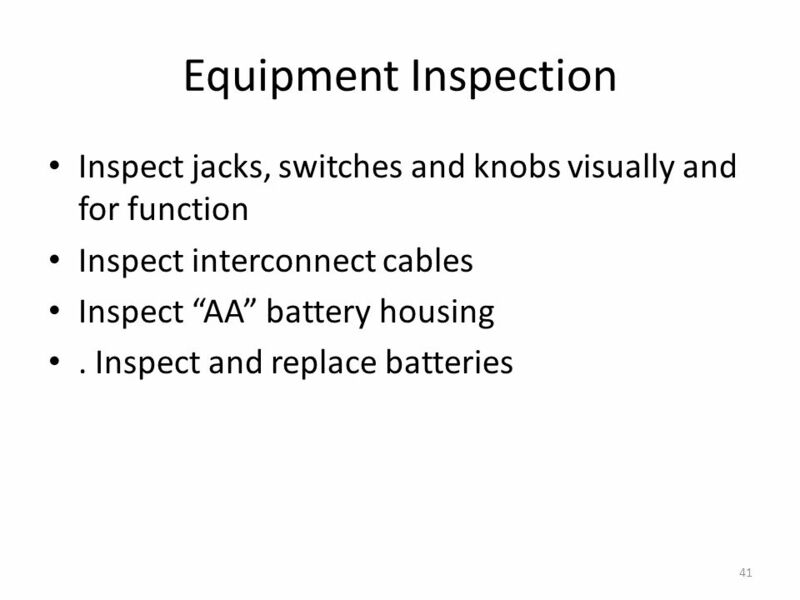 Inspect and replace batteries EQUIPMENT INSPECTION Perform the following inspection before and after each mission to ensure the ICRI-E is ready for use. Inspect and replace batteries. Inspect individual batteries for mis-shapen or leaking. Replace all batteries if any one batteries is damaged. Inspect “AA” battery housing. Inspect “AA” battery housing for residue left by battery leakage. Remove with a hair brush and clean cloth Inspect interconnect cables. Inspect interconnect cables for damage or loose parts. Substitute cable until damage can be evaluated to determine if functionality is affected. Inspect the gasket in the cover. Inspect the gasket in the cover. Clean away dirt, replace if nicked or torn. Inspect switches and knobs visually and for function. Inspect switches and knobs visually and for function. Clean away dirt; deadline if a switch or knob is broken/not functioning. Characteristics and features of the ICRI-2P Radio Interoperability Gateway Principles of operation of the ICRI-2P Radio Interoperability Gateway Maintenance procedures for the ICRI-2P Radio Interoperability Gateway How this equipment supports overall FAMS response SUMMARY This course has discussed: a.	Characteristics and features of the ICRI-E Radio Interoperability Gateway. b. 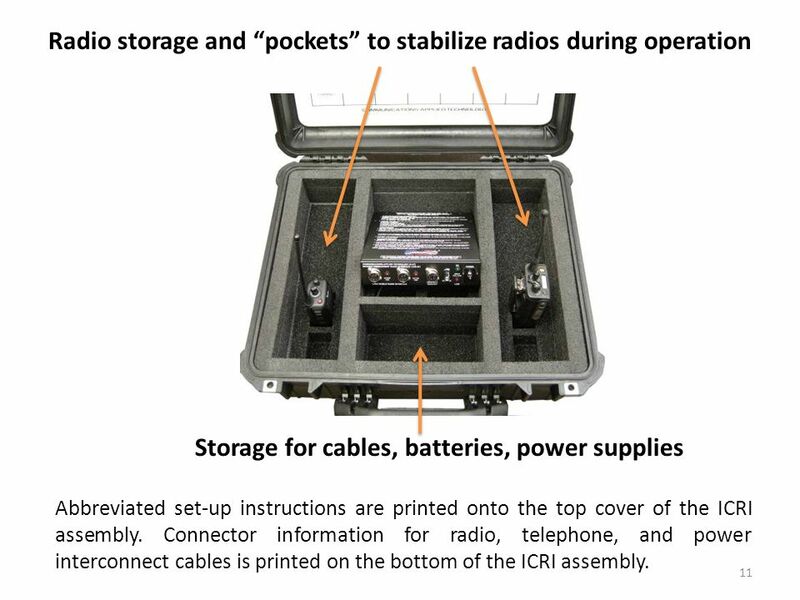 Principles of operation of the ICRI-E Radio Interoperability Gateway. 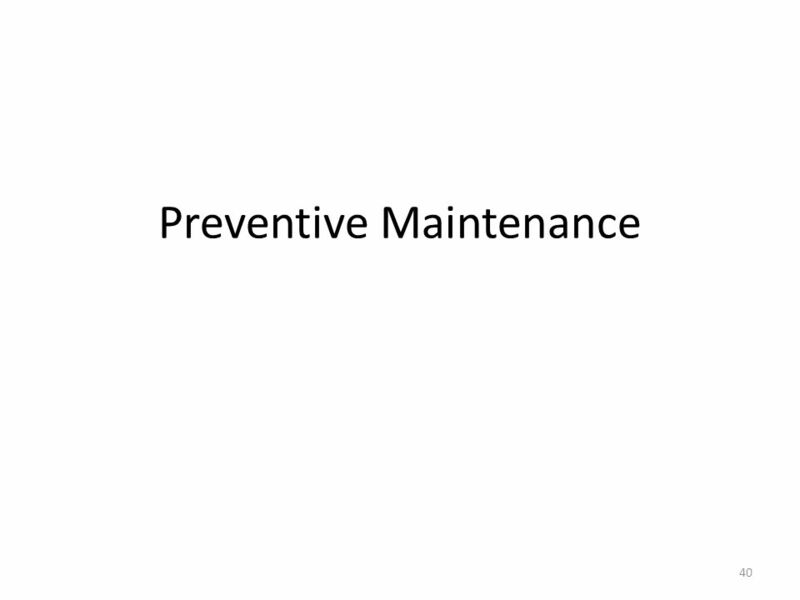 c.	Maintenance procedures for the ICRI-E Radio Interoperability Gateway. d.	How this equipment supports the overall IPP concept for CBRN response on the installation. 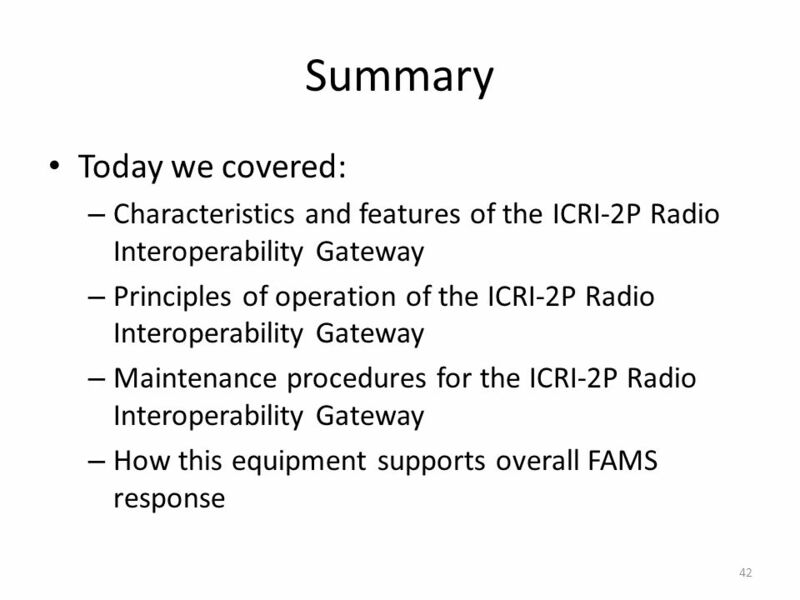 This completes our session on the ICRI-E Radio Interoperability Gateway. Are there any questions? 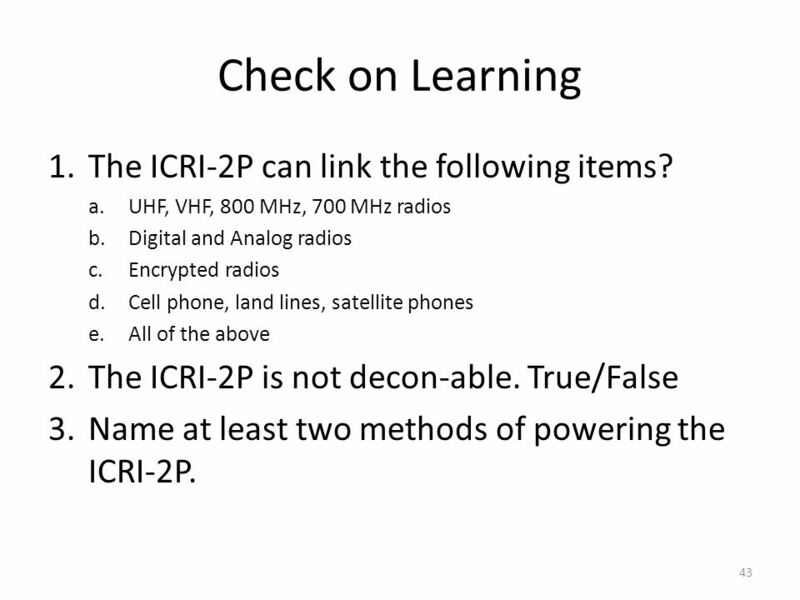 43 Check on Learning The ICRI-2P can link the following items? Download ppt "Rev B, 4/2013 M295 Individual Equipment Decontamination Kit"
O AK R IDGE N ATIONAL L ABORATORY U. S. D EPARTMENT OF E NERGY 1 Transitioning to Version 8 Building Data Entry Issues in NEAT/MHEA and Oak Ridge National. Chapter 3 Basic Logic Gates 1.